Draw the head and body by making two circles. Add the ears on the smaller circle, making it the head. Draw the wings with a one bigger curve on upside and small ones on the lower side. Join the corners with the upper curve and draw small legs on the lower side. Complete the legs and ears and draw features on face. Ta da… bat is ready for colors. Make a stem to the upper center. Start making vertical lines on the pumpkin. Curves lines on sides and slightly straight ones in center. Pumpkin is ready for becoming a Jack-o’-lantern. For this, draw triangular eyes and a zig zag mouth. Add these jack-o’-lanterns to your string lights and make them Halloween special ones. Then draw a bigger one slightly covering it. Make 8 legs, 4 on each side. In the small circle, draw eyes and a smile. Whereas, to the bigger one draw small dots. Color the spider in black or brown. To complement your hanging spiders and spider cards, make spider custom cupcakes and enjoy the theme to its full. From left side of it, draw a line downwards and curve it at the bottom. From the right side of the circle, draw another line, curve it at the bottom make it meet the end of first line. Draw hands on both sides. Make the bottom line of circle into lips. Make spooky eyes and color where necessary. Play a spooky sound behind your spirit characters and make it look real. First draw a hook shaped nose and then increase it on the upper side to make forehead. Similarly, draw a line below the nose and curve it at the end to make chin. Draw hair line in form of pointed edges. Draw a line of hat the hat above the hair line and make the hat. Give a final look by completing the hair and dress. What a witch without a broom. Make a perfect broom to go with your witch. For a perfect skeleton head, draw a slightly ovoid shape with a bit flat head. Draw another mountain like shape with a slightly flat bottom, overlapping the other shape. This would make the basic shape of skeleton head. Modify the shape by making bulges, as shown in the second figure. Draw the mouth and holes for eye socket and nose. Draw teeth in mouth and shade the whole figure in grey. Draw a circle and then an oval overlapping it. This would make the face and body. Make arms and legs by drawing ovals and then complete the hands and feet. Next up, draw two dots as eyes. Make a small strip handing from the arm and then draw uneven lines in the whole body in form of strips, just leaving the eyes. Color the kin around eyes as light brown and all the strips in dark and light grey color. Make a head and small leaf like hairs on both sides. Draw the eyes, nose and mouth on the face. Draw one complete ear on one side and one half cut ear on the other side. Also, make a stitches scar on the forehead. Draw the jacket and a torn tie. Make a torn shirt underneath it. Color the zombie to your best. Draw two tilt lines and make eyeballs on them. Make eyebrows on them and complete the eyes. Draw two curves on the eyes and extend them into nose line. Complete the nose and make a lip line. Draw the teeth and face. 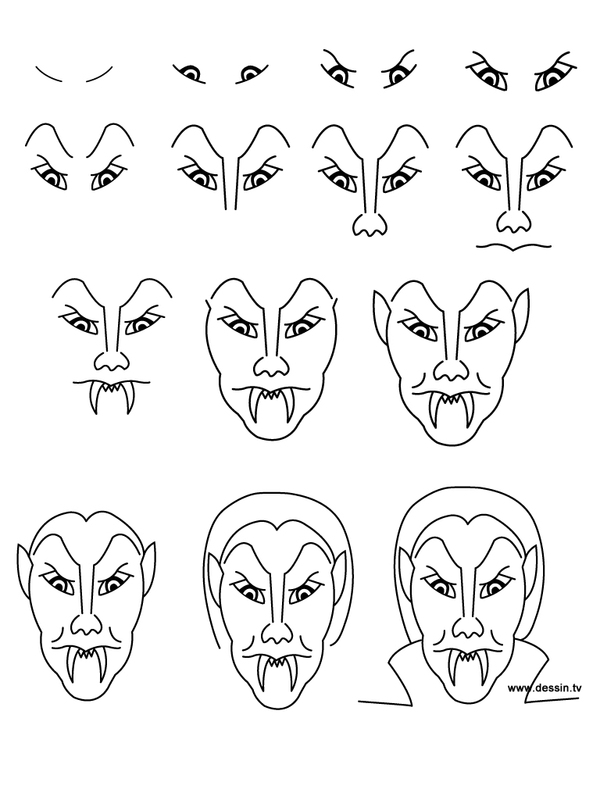 In the end complete the Dracula by making its pointed collar coat. Make a big cup shape head and a small body. Next, draw a scary face. Then add zig zag hair, ears and eyebrows. Add shirt sleeves and a belt. Then draw hands and arms. In the end, draw stitches and add bolts on both sides of the head.